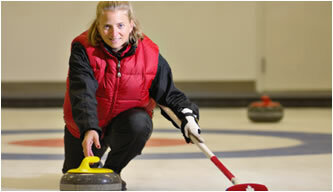 Curling is a great sport for our long Ottawa winters, and is fun for all ages. It provides exercise and team participation from October till April. Like any sports activity, there are risks of injury as one delivers a 40 pound rock down the sheet of ice, “sweeping” vigorously in front of its path to influence the curl of the rock. However, a little training and some lessons on technique go a long way toward preventing mishaps. Strengthening the core muscles (abdominals, back extensors) will improve your stability and protect you from back injury. Improving flexibility of hip flexors, hamstrings, and calf muscles will allow you to achieve the position required to deliver the rock smoothly. 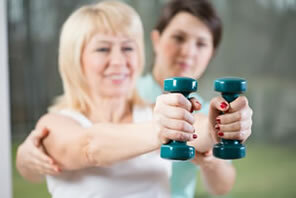 Strengthening shoulder muscles, especially the triceps and latissimus dorsi will increase your power for sweeping. Using correct equipment, such as a slider and a gripper will help you avoid a fall on the ice. Most clubs have loaner brooms if you don’t have your own. There are assistive devices for people who have difficulty squatting. Use of a “Stabilizer” or a “stick” to deliver the rock makes the game safer for people with restricted mobility. PhysioFirst’s skilled physiotherapists and massage therapist can help you prepare for the Ottawa curling season, or provide treatment to get you back on the ice after injury. Please give the Clinic a call for your assessment appointment.